Working Outdoors: Do You Have Everything Under the Sun? 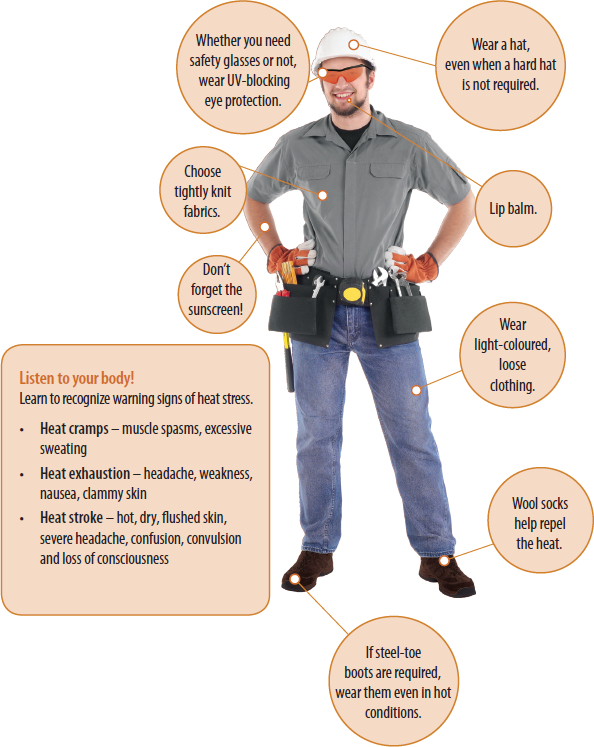 Hot sunny days can be dangerous for people working outdoors. Heat stress hazards together with the harmful effects of the sun can seriously endanger the health and safety of outdoor workers. Roofing work and lifting heavy loads are just a few tasks where precautions should be taken to prevent heat stress and sun overexposure. Drink lots of water before beginning work and about one cup every 20 minutes while working. Liquids with sodium content are also a good choice. Work slowly and take short, frequent breaks. Gradually increase the frequency, intensity and duration of your tasks as you become acclimatised. The sun is most intense between 10 a.m. and 3 p.m., so plan heavy work before or after peak intensity hours. Seek shade whenever possible. Wear a high SPF (15 or greater) sunscreen and lip balm, even on cloudy days, and reapply when necessary. Sunscreen should be used in addition to cover-up clothing, not in place of it.